Our Cirrus Truck Campers and TAB Teardrop Campers are built with the Alde Central Heat & Hot Water System. Click the video below to learn how this system works. Hi, I’m Mike with nüCamp RV. I’m here to talk to you a little about the Alde Heating System in our campers. 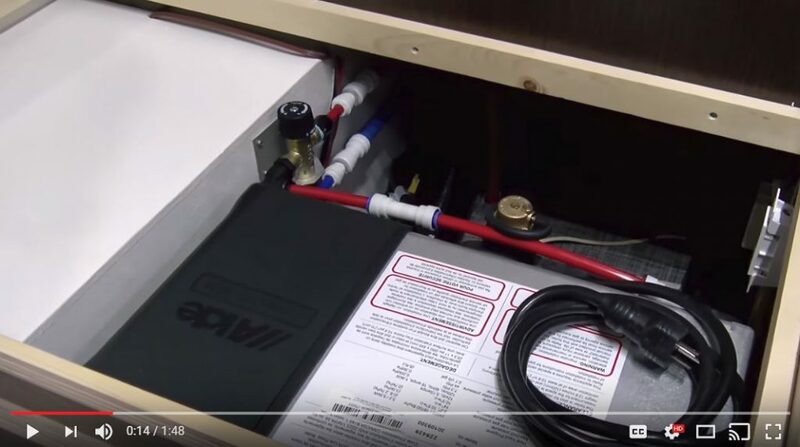 This is a Cirrus 920 Truck Camper and the system in this – essentially what the Alde System does is heat your water, as well as the unit itself. How it works is within the unit there are coils and inside those coils, you have either water and a fluid called glycol. Inside, there’s also a flame. That flame will heat up those coils and in turn, heating up the fluid that’s in those coils and reservoirs. From there, there’s a tubing that goes out from the unit and goes throughout the entire camper through the floor. Attached to that tubing are what we call heat fins or coils. Those coils will heat up and the heat resonates from those coils and comes out through the vents that are located on the floor of the camper, as well as the cab-over. The Alde has a separate 2.1 Gallon reservoir that will heat water for your shower or hot water faucets. That reservoir is connected to a different set of plumbing then the glycol, and never comes into contact with glycol. So, therefore, you get hot water. The control panel for the Alde System is located in the galley right above the sink. It’s all pretty much self-explanatory as for as the heat for the camper itself. You can run the Alde System off your propane, shore/electric, or you can do a combination of propane and your 12-volt battery. The Alde System cannot be run on your 12-volt battery only – it has to be a combination of propane and the battery itself.